You can also create custom field mappings to sync other HubSpot deal properties with Salesforce opportunity fields. Salesforce opportunities in multi-currency organizations can sync to HubSpot, but the integration cannot convert between currencies when syncing currency values. Only the number value will sync between Salesforce and HubSpot, and no exchange rates will be applied. Salesforce opportunities cannot sync to HubSpot if there are multiple deal pipelines in your HubSpot CRM. An opportunity can sync from Salesforce to HubSpot as a deal without an associated contact. For the sync to associate the deal with a HubSpot contact, the corresponding contact in Salesforce must be associated with the opportunity as an OpportunityContactRole. A deal created in HubSpot also syncs to Salesforce as an opportunity. 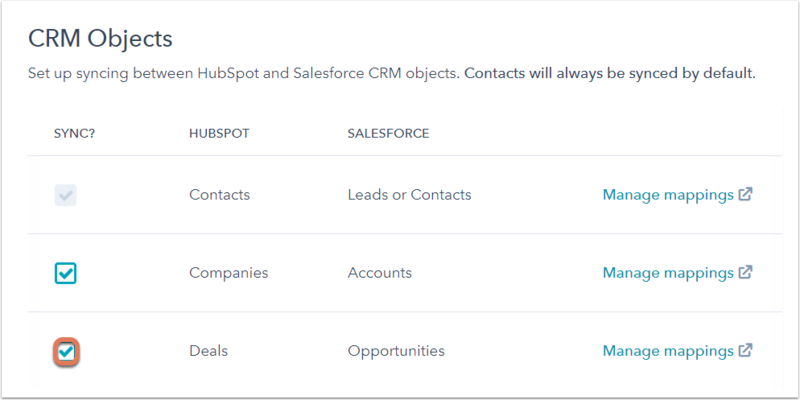 If a HubSpot contact is associated with the deal, the corresponding Salesforce contact record will be added to the Salesforce opportunity as an OpportunityContactRole. In the CRM Objects setting, select the checkbox in the Sync? column for Deals. Learn how to import your Salesforce opportunities to HubSpot. When you associate a Salesforce contact with an opportunity, the integration will update the deal's Lifecycle stage property, as well as sync additional properties from the most recently created opportunity. Associated deals: number of associated opportunities. First deal created date: date the opportunity was created. Recent deal close date: the date of the most recently closed won opportunity. Recent deal amount: the amount of the closed won opportunity most recently created and associated with this contact. Total revenue: the total revenue generated from each of a contact's associated opportunities. Please note: the Recent deal amount property is populated by the most recently created deal associated with the contact, not the most recently closed deal. Learn how to sync Salesforce accounts to HubSpot as companies.